Imagine what would happen if the Sciatica (the longest nerve in the body) was embroiled in a state of constant pain; a burning sensation that equated pins and needles, hurting, numbing and weakening your lower back, legs, and buttocks. This is the kind of pain suffered by 15-40 percent of the population who live with the chronic back pain condition known as sciatica. This painful ailment strikes the sciatic nerve, the longest nerve in the body that spans from the lower back through the behind and leg all the way to the foot. Sciatica symptoms can range from low-level tingling to crippling pain that can inhibit your ability to walk. Sciatica symptoms depend on the severity of your condition, however, the majority of these symptoms are indicators of other more severe physical problems. Sciatica sufferers must cope with everything from intense, shooting pain to cramping sensations; feelings that might intensify when the patient sits, sneezes or coughs. 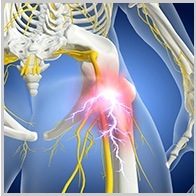 A number of related conditions cause sciatica, the effects of which pinch or pressure the sciatic nerve. A herniated or bulging disc that applies pressure to a nerve root is the most common cause of sciatica. Spinal bone spurs applying pressure on the nerves. The pregnancy-based pressure on the sciatic nerve, often irritated during this delicate time. Is there a feasible sicatica treatment? The good news is that the vast majority of sciatica cases can be treated without surgery. As always, Dr. Payam Moazzaz of New Era Spine will work to find and apply high tech and practical noninvasive procedures to the treatment of sciatica patients; with the ultimate objective of alleviating pain symptoms and enhancing mobility. From medication to physical therapy, and even spinal injections to ease inflammation and alleviate pressure on surrounding nerves. In those rare instances of sciatica in which surgery is required, Dr. Moazzaz might recommend a laminectomy, a procedure which removes a part of the vertebrae to ease nerve compression in that portion of the spinal column; or a microdiscectomy, a surgery to take out portions of a herniated disc. How can I avoid sciatica? Due to its direct relationship to a good number of trauma and diseases, not all instances of can be prevented. Yet those who maintain good back and body health stand the best chances against this disease. Exercising to fortify core and back muscles.